Some things simply go together, like turkey and stuffing, Bert and Ernie, dinner and a movie — or credit cards and rewards. So, given that these quintessential pairs are already double the awesome, how do you up the ante even more? Why, by pairing the pairs, of course. Take the Capital One® Savor® Cash Rewards Credit Card, for instance. This cash back card offers big bonus rewards for dining, entertainment, and grocery store purchases alike, giving cardholders the ability to turn that dinner and a movie into valuable cash back rewards. Right at the outset, the Capital One® Savor® Cash Rewards Credit Card stands out from the crowd with its triple-threat rewards categories. Not only do cardholders earn 4% cash back on dining and entertainment purchases, but they’ll also receive 2% cash back on grocery store purchases, and 1% cash back on everything else. In addition to purchase rewards, the good-sized signup bonus for the Capital One® Savor® Cash Rewards Credit Card provides pretty strong incentive for new cardholders to give the card a try. However, the equally high spending requirement may be out of reach for light spenders. If the high-rate bonus categories themselves aren’t impressive enough on their own, consider the fact that there’s no limit to how much cash back you can earn on any type of purchase, including those purchases that fall into the lucrative 4% bonus categories. Similarly, grocery store purchases will only qualify when made at a merchant that specifically codes as a grocery store. This means purchases made at superstores, like Target or Walmart, won’t qualify as grocery store purchases. If the Capital One® Savor® Cash Rewards Credit Card can be said to have one major downside, it’s probably the card’s annual fee. While the fee is waived the first year — making it free to try the card and see if it fits your lifestyle, that $95 kicks in the second year. On the plus side, you only need to spend $2,375 a year on dining and entertainment combined to break even on the annual fee, a feat easily achieved by most cardholders who dine out a few times a week. 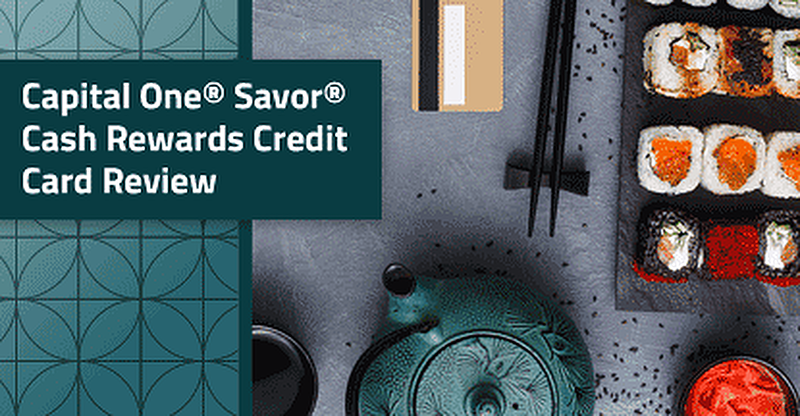 For consumers who balk at the idea of an annual fee, or who simply won’t spend enough on their card to make the fee for the Capital One® Savor® Cash Rewards Credit Card worthwhile, Capital One has another option: the Capital One® SavorOne℠ Cash Rewards Credit Card. Where the Capital One® Savor® Cash Rewards Credit Card charges no annual fee for the first year, the Capital One® SavorOne℠ Cash Rewards Credit Card never charges an annual fee, making all the rewards you earn pure profit. But while this card comes with the same bonus rewards categories as its big sibling, it doesn’t offer quite as high a rewards rate. Cardholders only earn 3% cash back on dining and entertainment purchases, though they keep the 2% cash back on grocery store pruchases and 1% cash back on everything else. Happily, cash back rewards are still unlimited, including rewards earned for bonus category purchases. In addition to variations in the annual fee, the two cards also offer different interest rates, starting with the intro-APR offer provided by the Capital One® SavorOne℠ Cash Rewards Credit Card (the Capital One® Savor® Cash Rewards Credit Card has none). Capital One® SavorOne℠ Cash Rewards Credit Card cardholders can enjoy an APR of 0% for 15 months on purchases and balance transfers. The cards also offer different regular APR ranges, with the Capital One® Savor® Cash Rewards Credit Card charging 16.74% - 25.74% (Variable), and the Capital One® SavorOne℠ Cash Rewards Credit Card offering a slightly lower purchase APR range of 16.24% - 26.24% (Variable). No matter which Savor card you select, you won’t pay any foreign transaction fees on purchases in foreign currencies, which makes either card a safe choice for shopping abroad. Both cards also come with Capital One’s basic benefits, including $0 fraud liability. Although we don’t typically think of them as we do loans, credit cards represent a line of credit. As such, you’ll need to undergo a credit check when you apply for a new credit card to ensure your level of credit risk is consistent with the issuer’s risk tolerance. For the Capital One® Savor® family of credit cards, applicants will generally need at least a good credit score to be approved. While the exact number will vary by scoring model, reviews suggest a credit score above 700 will give you the best approval chances. A credit score above 700 seems to also be the key to unlocking decent credit limits, with most reviewers reporting credit limits above $5,000 at the time of approval, and credit limits above $10,000 seem to be commonly reported for both cards. As is typically the case, Capital One doesn’t publish minimum or maximum credit limits, though no reviewers who were approved for either card seem to have received a limit below $1,000. The largest limit reported was a whopping $30,000. Of course, Capital One will consider much more than just you credit scores when considering your application. Even a high credit score may not be enough to get you approved, as a few Credit Karma reviewers discovered. The most common reason for being rejected for a new credit card despite a high credit score is that you’ve opened too many recent accounts (Chase is notoriously strict on this one), though Capital One doesn’t have a specific policy published. A poor history with the issuing bank can also be a factor. For instance, if you’ve ever defaulted on a Capital One card, you may not be approved for one, even if the default is off your reports. Banks keep internal customer records and may use them when evaluating your application. Looking across the web, the overall opinion of both Capital One® Savor® credit cards seems to be pretty high, with Credit Karma reviewers giving the Capital One® Savor® Cash Rewards Credit Card an impressive 4.9 out of 5.0 stars. The Uber Visa Card is no slouch, either, racking up an equally notable 4.8 stars out of 5.0. Most reviews wax eloquent about the duo’s awesome cash back rewards categories, especially the entertainment category, which includes a huge array of purchases, activities, and events. Of course, most of us spend more time dining out than hanging at the amusement park or local aquarium. The Capital One® Savor® Cash Rewards Credit Card‘s 4% cash back on restaurant purchases seems to be particularly popular among on-the-go cardholders who spend a significant portion of their budget on dining out. In addition to the purchase rewards, reviewers raved about the cards’ signup bonuses, several mentioning how easy they were to earn. Capital One also gets many kudos in the consumer reviews, especially the bank’s user-friendly mobile banking application. As you’d likely expect of any product, the cards aren’t without any detractors. Most of the negative reviews were from applicants who had not been approved for the card, however, rather than users who had a bad experience with the card. Since their inception, credit cards and rewards have gotten along like two peas in a proverbial pod, helping credit card issuers draw customers while simultaneously helping those customers save on every purchase. Indeed, the only thing that can make credit card rewards better than they already are is the opportunity to maximize your rewards by using a card that offers bonus categories that fit your lifestyle. For the many people who feel dinner and movie are the perfect pairing — or even the odd ones who prefer lunch and an aquarium visit — the Capital One® Savor® family of cards are an ideal match. Sadly, not everyone will qualify for the Capital One® Savor® Cash Rewards Credit Card, or its annual-fee-free sibling, the Capital One® SavorOne℠ Cash Rewards Credit Card. But, if you’re concerned about your chances of being approved, there’s a way to get a little extra assurance: pre-qualification. Credit card pre-qualification (sometimes called pre-approval) uses a soft credit inquiry that won’t impact your credit score to gauge your general chances of being approved for a credit card. While being pre-approved isn’t a guarantee you’ll get the card if you apply, it can be a good indicator of your chances. Similarly, if you’re not pre-approved for one of the Capital One® Savor® credit cards, you may want to reconsider applying for either card. Instead, take a look at your credit profile and see if there are negative accounts that may be hindering your chances for approval.